NewBlueFX Titler Live is a powerful live graphics generator that works across several popular platforms. I started my review with the Titler Live 3 Complete version, and midway through my review, I upgraded to the new Titler Live 4 Complete version ($949). The Complete version contains all of the features found in the Titler Live Present, Social, and Sport versions. My main interest in this on-air graphics solution was to add dynamic titles and graphics to live video broadcasts that I produce with vMix. The Complete version offers two channels of graphics and my plan was to connect Titler Live with vMix over NDI. 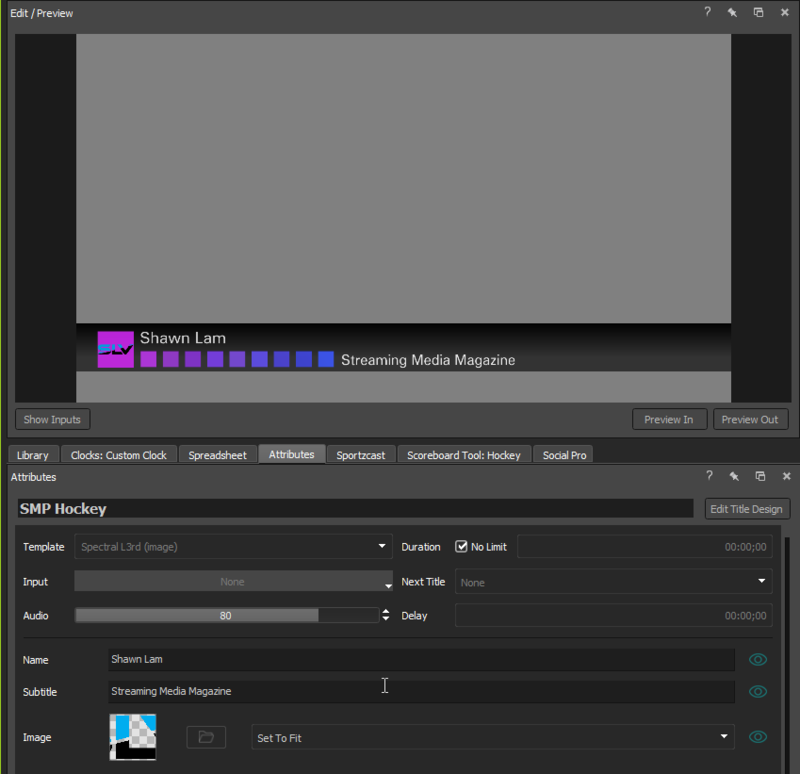 The NDI protocol allows Titler Live to connect to any other NDI system, and there is even a direct connection option for OBS and AirSend for TriCaster. If you’re running a video switcher that doesn’t support NDI, or doesn’t have its own direct connection option, you can also use Titler Live over HDMI. Connecting Titler Live to vMix over NDI is a three-step process. First, the two systems need to be connected to the same network. Ethernet is a more stable option, but you can also use a fast Wi-Fi connection. With Wi-Fi, you will need to make sure you have enough transfer speed and are not dropping frames. The second step is to set the output in Titler Live to NDI, and the final step is to add an NDI input in vMix. The graphics come into vMix pre-keyed, so you only need to apply the graphics channel to one of the four overlay channels in vMix to take it live. I found it interesting that once I connected Titler Live over NDI to vMix, I still had the ability to make changes to live titles in vMix. Despite this, I found the best workflow was to operate Titler Live from a separate laptop and make all my changes in Titler Live, using vMix to take one or both channels that I was sending graphics over. My secondary interest for using Titler Live is with hardware video switchers such as the Blackmagic ATEM line or Roland V-60HD. This workflow connection uses the HDMI output from the graphics card of your laptop or workstation that Titler Live is running on. Selecting the HDMI output produces a small preview window where you can set the background color to black, blue, or green. Next, you drag the HDMI preview window from your primary monitor to your HDMI-connected extended monitor, in this case your video switcher. Then, on your video switcher, you need to key out the black, blue, or green background, and you’re ready to take your graphics live. The Design Templates in Titler Live Complete are grouped into 16 folders. I was impressed with the number of professional templates available. I found that Titler Live allowed me to take my graphics to the next level quickly, and this is especially important because I’m stronger on the technical side of video production than I am with the design and creative aspects of video production. The design templates provided me with a starting point that I could easily customize to fit the look of individual events I produce. The best part is that the graphics are all animated and you can quickly preview the start, middle, and end of each graphic by hovering over the template thumbnail. Once you add a graphic to your playlist, you can change the attributes. Each graphic has its own set of customizable attributes, depending on how many elements are in the design. The most basic lower-third titles will have Name and Subtitle fields, while more complex sports scoreboards will have fields for logos, team colors, game and penalty clocks, and much more (Figure 1, below). My only knock with the hover previews is that they didn’t preview the middle part long enough for me to get a good look. The middle is the static graphic view that, in practice, would be on the screen the longest, while the animation in and out are the motion transitions. When I open the Edit Title Design window from the Attributes tab, I see why this is so. The start and end animations are timed with set durations that you can easily make shorter or longer, but the middle section is normally held until you manually trigger the animation out, so its duration is only a few frames long. I would appreciate a setting for the previews where I could set the middle duration for the hover previews or have them all default to at least a few seconds. 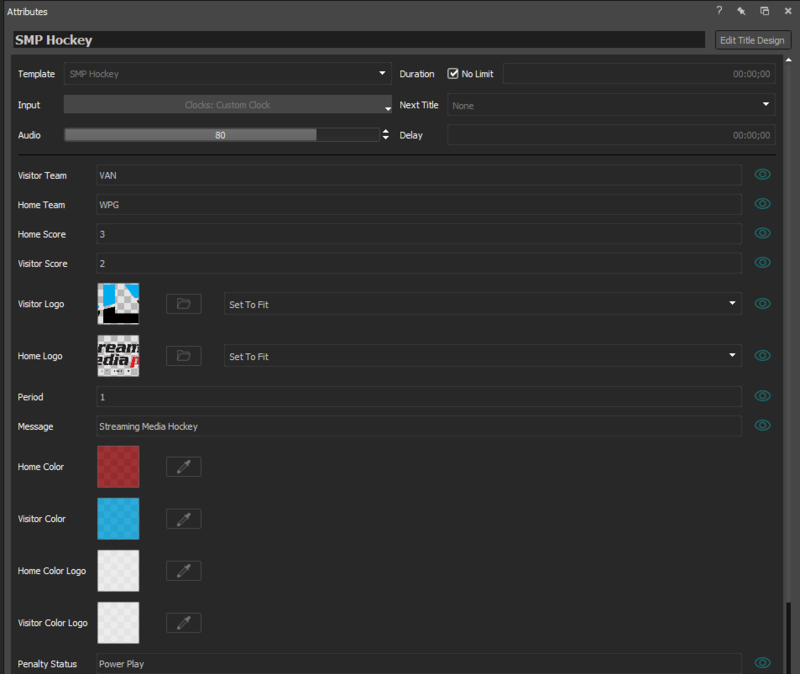 Overall, the Attributes and Edit Title Design controls were very easy to use. When you finish making edits to a graphic in one of two playlists, which can each hold 15 graphics, Titler Live automatically renders your graphic (Figure 2, below). Having a discrete GPU is a must when using Titler Live. Graphics render in seconds, which is a much quicker workflow than designing and exporting graphics in After Effects. The result is that you can roll with the punches and adjust titles on-the-fly while live to accommodate ever-changing content. In this tutorial we'll look at two effects from NewBlue Essentials as the first installment in a series on the NewBlueFX TotalFX plug-ins package.